This is the BEST youth sailboat that exists in the world today. A wind of change is what the O'pen BIC has brought to the world of dinghy sailing for kids. Young sailors now have a true glide machine for real excitement on the water. The O'pen Bic, with its modern and powerful rig, is a fast boat, quick to respond, self-bailing, and is fitted by the best marine hardware manufacturers (North, Ronstan, Robline). The O'pen BIC is THE link between the Optimist generation and the new generation of sailing dinghies. Not only is it a fun boat, for pure enjoyment on the water, but it's also a clever and quick racing boat. 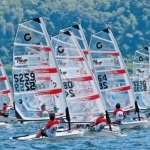 The O'pen Bic is now an International ISAF class, and a complete race program has been established world-wide. Recognizing the dynamic and modern nature of the O'pen Bic, many youth sailing programs and schools have chosen it to be their officially-recognized boat for their young sailors. We here at the Wind Power Surf Shop are FULL supporters of the O'Pen Bic and have helped establish countless new youth sailing programs and schools throughout the Greater Midwest Region. Contact Wind Power today with further questions! !